Editor-in-Chief Dr. Zoran Pazameta, Eastern Connecticut State University, USA. 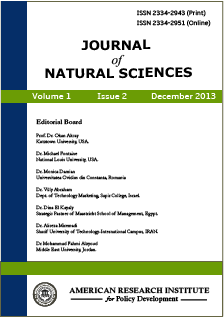 Journal of Natural Sciences is an international peer-reviewed journal that focuses on every aspects of fundamental and applied sciences research. The journal seeks to publish experimental, computational and theoretical studies of fundamental and applied sciences, engineering, and technology and health sciences. The journal is devoted to related sciences and publishes articles from around the world presenting results of major research from all earth sciences. All research articles in this journal have undergone initial editorial screen and rigorous peer review. Each paper published in Journal of Natural Sciences is assigned a DOI®number, which appears beneath the author's affiliation in the published paper. Click HERE to know what is DOI (Digital Object Identifier)? Click HERE to retrieve Digital Object Identifiers (DOIs) for journal articles, books, and chapters. Dr. Zoran Pazameta, Eastern Connecticut State University, USA. Prof. Thresa O. Corcoro, Ph.D.; Notre Dame University, Philippines. Mr. Abolghasem Zare Shahneh, Cranfield University, UK. Ing. JánTvarožek PhD. ; Alexander Dubcek University of Trencin, Slovakia. Amadalo Maurice Musasia, PhD; Masinde Muliro University of Science and Technology, Kenya. Dr. Fauziah Sulaiman, Universiti Malaysia Sabah, Malaysia. Dr. D. Srinivasa Kumar, GMR Institute of Technology, India. Prof. Khlaif Mustafa Gharaybeh, Al-balqa Aplied university, Jordan. Dr. Lim Chaw Jiang, Universiti Putra Malaysia, Malaysia. Mr. Ogunkunle Clement Oluseye, University of Ilorin, Nigeria. Dr. Eja Iwara Eja, University Of Calabar, Nigeria.